This workshop discusses the different options of lighting your scenes, so that you can get the best out of your Xfrog plant renders. This workshop shows how to load plants from Xfrog Plant DVD´s and how to adjust the materials. 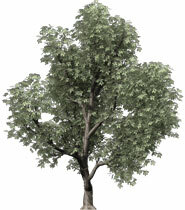 We will also create a lightdome and render the plant with mentalray. This workshop gives you some information about adjusting Xfrog plants to get the best out of them in your Vray renders. This workshop will show you how to create a custom Maxwell material that is capable of rendering leaves mit alpha maps.